Some of you might have noticed some new, cool forces gracing our store section's cabinets this summer. These are hand-picked highlights from our dear player community and from Fight Club combatants that have been kind enough to have us display their armies! This exhibition will now be accompanied by mini interviews to shed light on the artists behind these brilliant collections. These interviews are conducted in English because of our community's international flavour. Today we introduce commander Darryn Lee! I'm Darryn Lee, I'm from South Africa but have been living in Finland 6 years now. I'm a school assistant in an English language elementary school in Helsinki. My other hobbies are swimming, being in nature, reading, writing short stories and poetry and learning languages (6 so far and counting!). I started in 1998 with a single box of skeleton warriors, bone paint and ink wash. I wish I had kept those, I had no idea how to use wash so they were mostly black! I discovered Warhammer at the local shop that sold Dungeons and Dragons supplies and instantly fell in love. Wargaming wasn't so big in my home town back then so I played in my friends garage/gamestore/hobby room for many years as well. I've got Blood Axe Orks, Veterans of the Viet-Nork Waaagh! led by the cunning but brutal Kernul Kill-gore. An undivided Chaos Daemons army... I like to think either the Changeling or Fateweaver is pulling the strings in that one. A growing Tyranid Swarm called Hive Fleet Nyoka (isiZulu for snake). And my beloved Death Korps of Krieg, led by Colonel Flockenstuffen. Big guns never tire! As you can tell, I love playing hordes (my wallet disagrees!) so my favourite kind of roster is one where I get to drown my opponent in bodies. I'm just a little bit happy that all the horde infantry got cheaper in the newest edition, more boots on ground lads... or claws... or hooves... whatever! Make them run out of bullets! I've also recently started Gatormen Minions for Warmachine and Hordes. That would have to be our yearly journey to ICON in Johannesburg when I was younger. Its the biggest gaming/hobby event in South Africa, we would drive 6 hours to sleep on the floor in the cold (no insulation so around 1 degree inside at night!). We'd be up all night, freezing and painting our last minis for the next day, laughing and reading our rule books one last time, and then get a full two days of gaming against some of the best in SA. Good times and excellent memories. 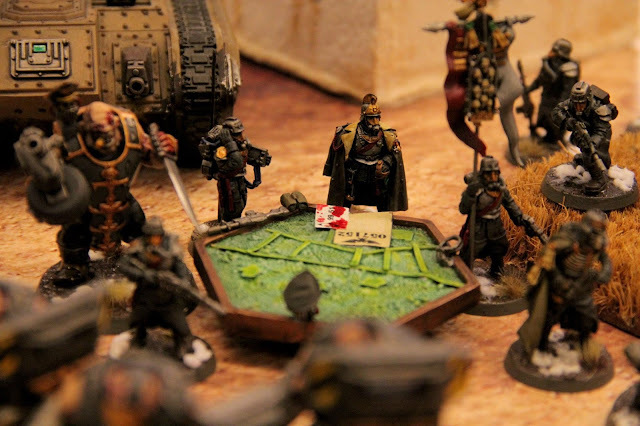 My Death Korps recently won best painted army for the white alliance at a War Head tournament. I also won best painted with my Lizardmen way back in 2002 at a tournament in my home town. That would be David "Dirty Daddy" Jackson. I've played his Cryx dozens of times and managed to beat him just once! It really feels like I am a fly walking blindly into his spider web every time I play him... One day David, one day! Also have to shout out to Travis "crazy ginger hiding in the woods" Finneran. Every game plays out like a Michael Bay movie, explosions, action, excitement and adventure, the personification of forging the narrative. That would have to be Private Perkins, the lowly Imperial Guardsman. In a world filled with horrific aliens, never ending war, planet killing weaponry, living nightmares and superhuman soldiers, it's the average human who stands up to these with nothing more than a rifle and a bayonet who are the real heroes. I really like how they reset the board and everything is usable again, even the most humble units from the previous editions have a place in the new, and it seems for now that its going to stay that way! There is also a whole new level of tactics around positioning, consolidation and movement. Fun times, good job GW! I think its too early to criticize 8th edition although I hear the grumbling already. People should enjoy the new breath of fresh air, dust off those unused models and give them a whirl! Its really great fun. Thanks Darryn and keep up the great hobby spirit! Darryn (vasemmalla) otti mittaa Mauri Lunkan Solar Rogues -marineista viimeisimmässä War Head Rookies -turnauksessa.